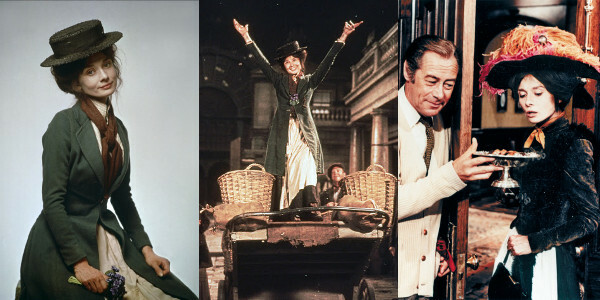 After writing last week’s article about looks inspired by the (sadly cancelled) Selfie, I realized that CF had yet to pay homage to its source material, My Fair Lady. This beloved movie musical stars Audrey Hepburn as Eliza Doolittle and Rex Harrison as Henry Higgins. For more movie-musical fashion, check out our previous articles with outfits inspired by Little Shop of Horrors, Les Miserables, Sweeney Todd, and Chicago. Set in Edwardian London, the story follows Eliza Doolittle, a rough-mannered, uneducated Cockney flower girl. A chance encounter with Henry Higgins, a snobby and cantankerous phonetics professor, changes her life. On a whim, he makes a bet that he can teach her to speak proper English and that he’ll “make a duchess of this draggle-tailed guttersnipe,” a proposition she accepts in the hope of raising her social station. Eliza’s physical makeover is easy (heck, this is Audrey Hepburn we’re talking about! ), but she and Higgins clash magnificently during the arduous path towards impeccable speech and perfect manners. Julie Andrews originally played Eliza Doolittle in the Broadway production, but the film role instead went to Audrey Hepburn. While Hepburn recorded all of the songs in the movie, the majority of her vocals were later dubbed over by Marni Nixon. Before her transformation into a posh member of high society, Eliza is a ragged but plucky character who sings of her desire for a warm, loving home of her own (and lots of chocolates to eat!). Despite her dirty clothes and smudged face, Eliza’s pre-makeover look is rather endearing in a fictional gamine sort of way. Channel Eliza’s lively personality with a tie-neck blouse and a plaid midi skirt. 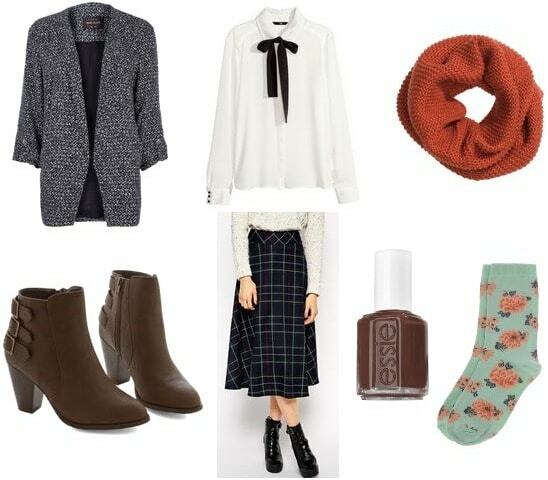 A textured blazer and rust-colored scarf will keep you cozy, while floral socks will brighten your spirits every time you glance down at your feet. Warm hands, warm face, warm feet indeed! Last but not least, Eliza would surely approve of a nail polish in a yummy chocolate brown hue. After Eliza shows progress with her elocution, Higgins and his friend Colonel Pickering decide she’s ready to make a test debut at a high society locale: the Ascot Racecourse. While she initially makes a good impression on the upper crust, she gives herself away when she gets caught up in the excitement of the races and lets loose a string of profanity that shocks the crowd. 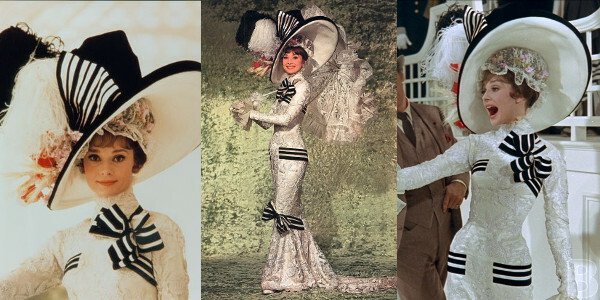 Eliza’s deliciously over-the-top Ascot dress is one of the most iconic movie costumes ever created (and, if you ask me, totally trumps Holly Golightly’s LBD.) While the Edwardian silhouette isn’t likely to be trending anytime soon, a striking combination of elegant lace and bold stripes will always be in style. A demure long-sleeve shift paired with subdued blush pumps lets a graphic striped blazer take center stage. Skip the enormous hat – trust me, the classmates sitting behind you will thank you for this choice – and instead opt for an eye-catching headband. Would you wear these outfits? Are you a big fan of My Fair Lady? What other movie musicals would you like to see featured? Let me know in the comments!